I absolutely love my new Alfa Romeo Giulia Ti and now I love it even more with the new performance exhaust I installed with Franco from Franco's Imported Cars yesterday. The video with sound is at the end of this post. 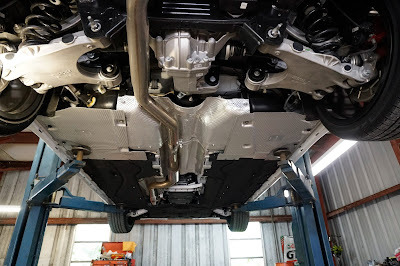 This system is offered by Madness Autoworks located in Austin Texas. ( And for those of you on the left coast, they have a California location) The system is offered in two levels, a Monza version which is the more aggressive sound and then the Lusso version which is what I purchased. 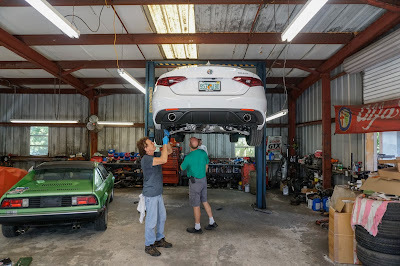 So here's my Giulia up on the lift at Franco's Imported Cars in Largo, FL showing the Y pipe at the rear. Alfa Owners Club friend, Delmas Greene inspecting the work. 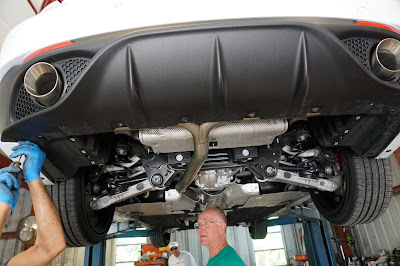 Note Y pipe and large chrome tips that fit the diffuser perfectly. Here's the system as shipped. 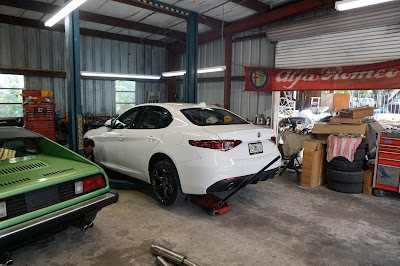 Getting ready to put it on the lift, note Alfa Romeo banner. 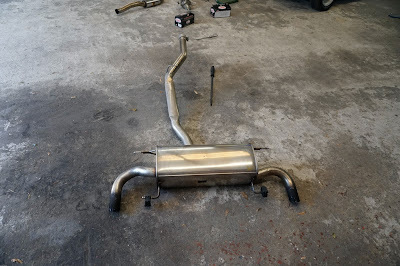 Huge muffler on stock system. This system gives the car a new character and personality without screaming 'hey look at me'. It has a nice, sports car sound and under aggressive acceleration (especially in Dynamic mode) the car comes alive. When just cruising around city streets it has a nice balance of throaty tone yet is very subdued. In one day of driving it has also turned a few heads, for example, I took my Giulia down to the local Shell station to fill up and when I started it up to leave a guy getting in a big four wheel drive Chevy pick up stopped and watched me pull away- almost as if to say is that the new Quadrifoglio? I got the impression of a silent thumbs up, only he didn't know what to make of the Giulia. Like wow, what is that! So if you want a quality built great sounding exhaust, check out Madness Autoworks. 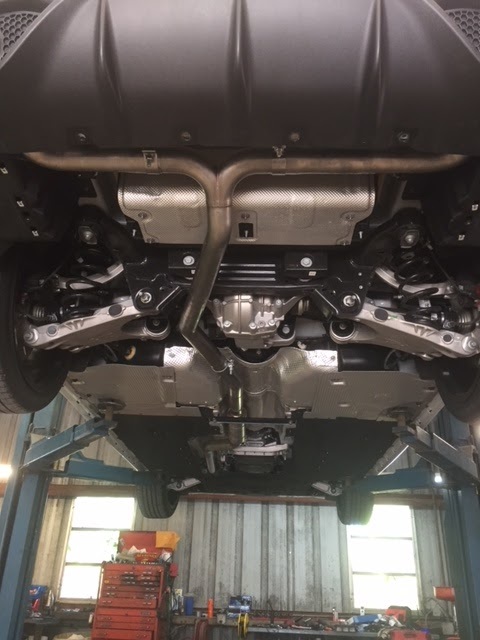 And they offer many other performance parts and pieces to customize your ride.They were super to work with and really know their Alfa's. And here's an added bonus video of the Quadrifoglio version of the Giulia. Turn up the volume! 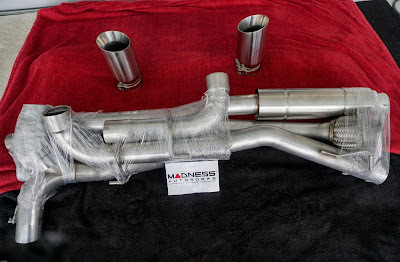 Hope you liked the post and for you new Giulia owners, and thank you Madness Autoworks.